Oterp is a mobile phone game project using a GPS sensor to manipulate music in real time, depending on the player’s position on Earth. It generates new melodies when travelling. The objective of Oterp is to mix the reality of our everyday environment with a video game. 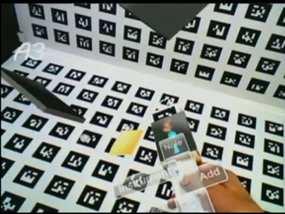 This is a new way to imagine our movements in a society increasingly on the move and dependent on mobile interfaces. Call For Proposals: Open Call: Learn to Play :: Are you a game maker? Are you telling compelling stories about your life or the world around you? Are you doing interesting things through games and interactivity that cannot be done elsewhere? Playlist, playing Games, Music, Art :: June 4 – August 21, 2010 :: Opening: June 3; 6:00 – 11:00 pm :: iMAL Center for Digital Cultures and Technology, Koolmijnenkaai 30 Quai des Charbonnages, 1080 Brussels. 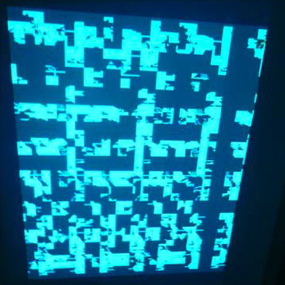 Make a noisy chip toy! :: December 16, 2009; 4:00 – 9:00 p.m. :: 9-15 Wyckoff Ave., Queens, NY (Directions). Want to make your own chip toy? For $15 in parts, you can. We’re going to open up Babycastles at 4p for an open lab with the Loud Objects kits. Make it if you can, and bring soldering iron(s). (We’ll keep soldering kits right on to close at 9p!) We’ll also have other custom creators; got some project you want to bring, or just want to fiddle with your Game Boy? Bring it on! 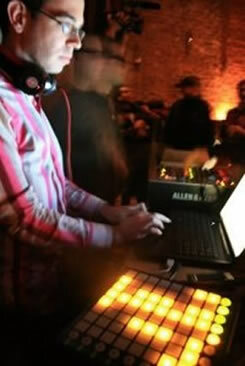 Party with Indie Gamers and DIY Chip Musicians, 6:00 – 9:00 p.m., Free! The party starts at 6:00 p.m., with independent games to play in the arcade and their creators, geeky greet + meet, noisy things to hear, stuff to see. All artists and art lovers welcome. Ends at 9:00 p.m. so those in Blip Fest can get back to Manhattan. 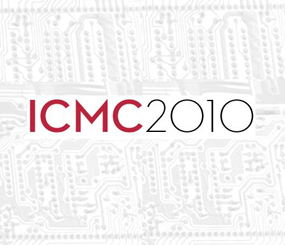 Analogous Interactions @ International Computer Music Conference :: June 1-5, 2010 :: New York City :: Call for Works — Deadline: December 31, 2009. Playlist: Playing Games, Music, Art curated by Domenico Quaranta (Brescia, Italia) :: December 18, 2009 – May 17, 2010 :: Mediateca Expandida de LABoral Centro de Arte y Creación Industrial, Los Prados, 121, 33394 Gijón – Asturias. Orchestra Hero by Michael Gordon :: Writing for the New York Times, Gordon poses the question: Will scenes like the image to the right from the Guitar Hero video game (image by The Associated Press/Activision) soon include French horns, contrabassoons and triangles? And his answer is, he hopes so. What is the hottest thing in music right now? A pair of video games ─ Guitar Hero and Rock Band. Anyone can play. 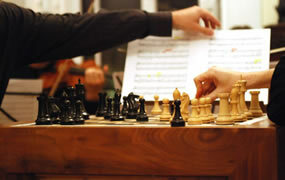 The games allow you to become a member of the band. 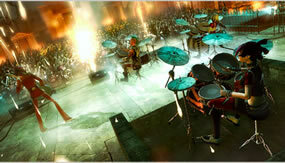 Each game offers a range of pop music hits on game controllers that look and feel like guitars and drums. What makes these video games so much more impressive than “air guitar” is that through the use of something called the instrument game controller the player actually experiences the visceral feeling of performing music. You can even improve if you practice. 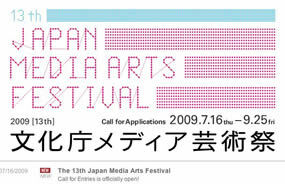 The 13th Japan Media Arts Festival starts to accept entries today, July 17th, 2009 :: the application period is until 25th September 2009 :: Art, Entertainment, Animation, Manga :: Award-winning works will be exhibited 3-14 February, 2010 at The National Art Center, Tokyo.